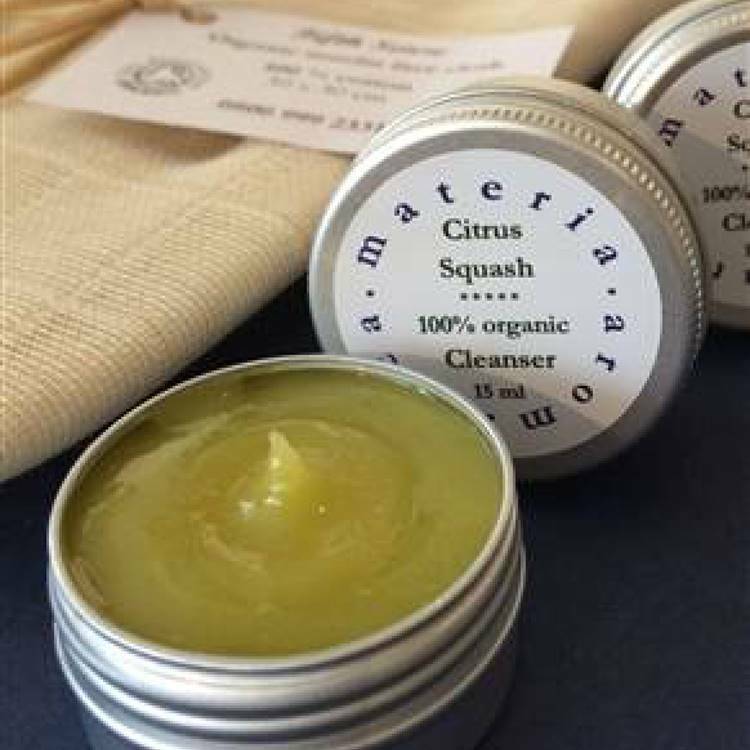 With Avocado and shea butter, fragranced with the refreshing and up-lifting aroma of the citrus fruits to brighten up a dull morning or clear the cobwebs of a busy day. The cleanser will remove effectively all traces of dirt and makeup, leaving the skin nourished and supple. The texture is such that the finger sinks into the balm with ease. Take a pea-size amount on the tip of one finger, spread on the tips of the other fingers and onto the face, massaging well into the skin. The warmth of the skin will melt the balm rapidly for an easy application. Remove all traces of dirt and make-up with a warm wet cotton pad or a konjac sponge. Repeat several times until the cotton pad stays clean. The skin will feel fresh and supple. 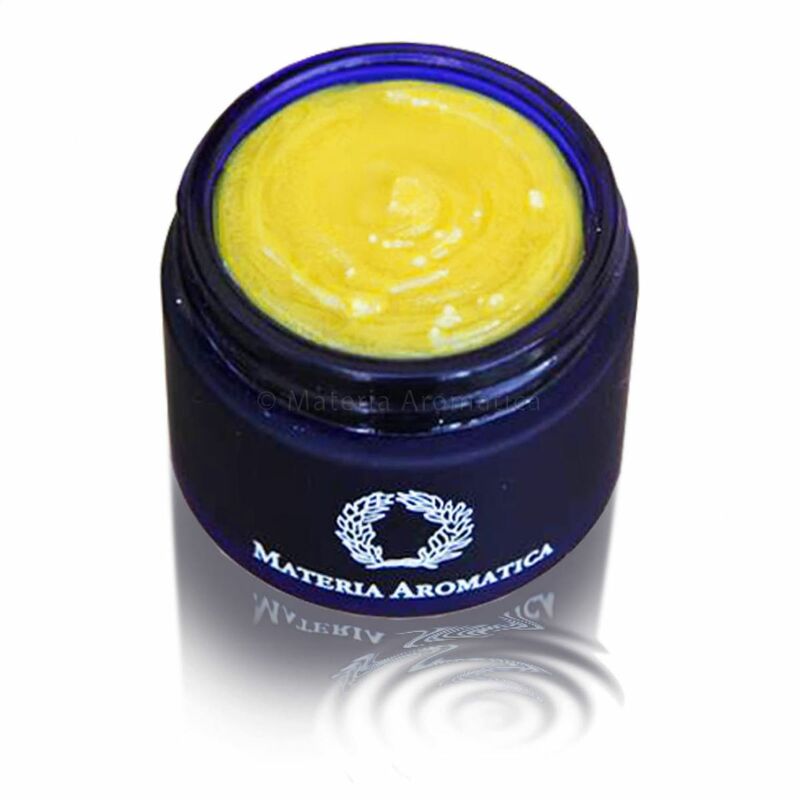 Use rose, lavender or chamomile water to tone followed by your favourite mositurising cream or oil. 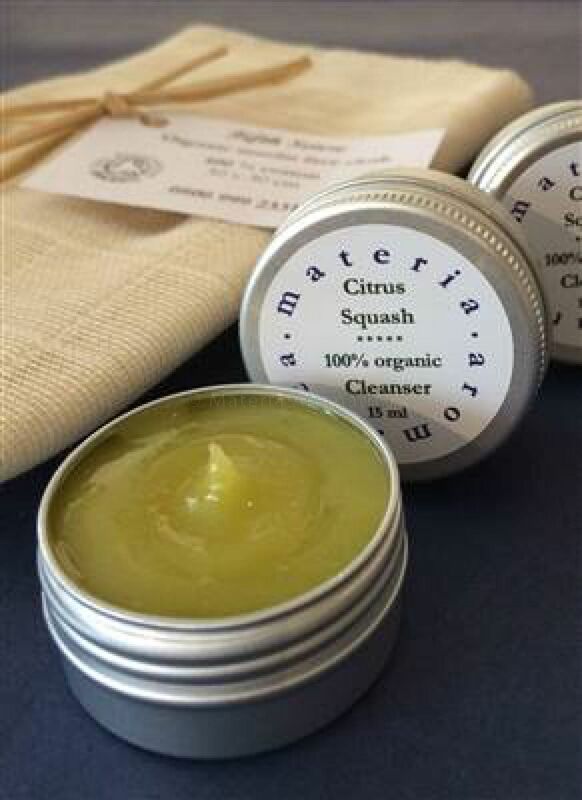 Citrus Squash is susceptible to temperature variations and will soften in warmer weather. The Shea butter will melt slightly and re-solidify forming little beads. This will change the consistency of the cleanser but will not affect in any way the efficiency of the cleanser or its shelf life. The little beads will melt in contact with the warmth of the skin of the fingers and face. I find this is great for taking off my mascara. I have very sensitive eyes and find all cleansers and eye make-up removers I have tried in the past have irritated them- even the products supposedly meant for sensitive skin. But this cleansing balm is fab! Reeeally gentle yet effective- removing all traces of eye make-up without so much as a hint of a bloodshot eye! Smells nice, too! As with all the products this is beautifully packaged and I love the colour of the cleanser especially against the colour of the jar! The product goes a really long way and is quite unique in every way. The texture is no greasy and is ideal for soft cleansing and make up removal. It is well compliment by the rose toner. This is a wonderful product that really gives your skin a lovely fresh and very clean feeling. It's great to know that the ingredients are 100% organic too!